Right now, as you read this, the nerves in your brain are battling one another for territorial command of brain space. In fact, if you continue to read this (and all the other blog posts I write), you’re helping one side dominate the other (the nerves associated with reading, learning and instigating). Who are these nerves fighting? They’re fighting the multitude of bad habits you’ve accumulated over the years. Things like smoking, comfort eating, spending money you don’t have, staying home instead of going for a run, watching tv instead of writing…the list goes on (and on, and on). Every single one of these actions represents a series of nervous system input (reaching for a cigarette, lighting up, inhaling deeply, etc.). The more consistent time you spend on an activity, the larger its brain territory becomes. Over the course of 20 years of bad eating habits, you have terrain completely dominated by the enemy. 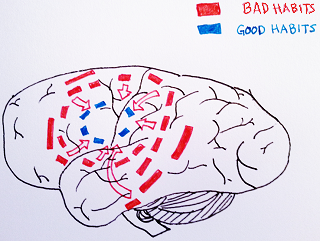 Every time we repeat a bad habit, it gains more control over the map. The territory expands and the territorial lines strengthen. On the flip side, you may have good habits you’d like to build on or new habits you’d like to start (workout more, eat healthier, learn a new language, write a book, start a business), but they control so little territory it’s like trying to take over China as the commander of Monaco. The reason it’s so hard is because we’ve had the habit of starting ground out of us. If you’re like most people, the habit of hiding replaced your natural instinct to start. Instead of being encouraged to instigate, we became masters at hiding. We’ve had lots of practice too: hiding in the back of class; hiding from advanced placement; hiding by taking 7 years to graduate college with a bachelor’s degree; hiding by going with the crowd, never trying to stand out, and never testing the limits of our own abilities. This habit of hiding (of avoiding starting at all costs) is costing us our sanity, our happiness, and our self-respect. We want desperately to begin, to build good habits, but we’re fighting decades of bad habit. By now, our maps are almost entirely controlled by our bad habits. Trying to reconquer the territory is a serious undertaking, something that takes more than a day and more than good intentions. If you want to take back control of your brain territory, you have to understand you don’t have the upper hand, all momentum is in the opposite direction, and you will be fighting an uphill battle. Don’t try to regain control over every territory at once. It won’t happen. You’ll lose focus and your bad habits will crush you. Focus on one specific area. Use the power of concentrated effort to break through enemy lines in order to gain a foothold before you move onto something else. If you want to eat healthier, manipulate your environment to make it easier. Get rid of junk food. Never go shopping for food hungry. Only keep food in the house that you consider healthy (sorry, no hiding snacks). For the first few weeks, focus all your effort on getting control of this territory before moving on to something else. The only way to break through enemy lines and expand friendly territory is through consistent, daily action over the course of 4 weeks. That’s right, 28 days. This is the amount of time it takes for the neural pathways to strengthen and for the action to go from an activity to muscle memory. After 4 weeks, it doesn’t mean that you stop doing the activity – and it doesn’t mean the new muscle memory has become effortless habit. It simply means you’ve developed strong synapse connections, allowing you to more easily repeat the activity. So keep going even after 4 weeks! Brain maps are topographical, meaning the portions of the body’s surface that are close together are mapped close together in the brain. Similarly, when we perform an action that requires multiple motor movements (or multiple sensory inputs), the brain maps these neural pathways close together. Running, for example, requires multiple inputs from various body parts, but the composite action is mapped locally on the brain. You can apply this knowledge by building good habits on top of other good habits. Have you already created a habit out of waking up early? Expand on this good habit by sitting down for 10 minutes to write before work. Your brain will begin associating early rising with writing. After 28 days, expand topographically again: spend 30 minutes writing, or focus on making a healthy meal before you sit down to write, or after writing, go for a quick 15 minute run. Understanding the brain, how neural pathways strengthen and weaken, and how focus and repetition expand brain map territory, is the science behind what I talk about on this blog and the cornerstone to my concept of the art of instigating. The habit of starting is a real thing. There are very real neural pathways that develop your brain map territory, and the habit of starting (like the habit of working out or eating healthy) requires that we practice every day to maintain and expand that territory. If you don’t develop the habit of starting, you won’t be successful – period. Every single successful person in the world (whether you measure success in terms of money, fame, happiness, or by some other criterion) has developed the habit of starting – they’ve made instigating a way of life. We build empires one day at a time, one habit at a time, one successful action at a time. Create the habit of starting, learn the art of instigating, and build the empire you’ve always wanted to build. Good stuff here Tom! I like the battlefield analogy. You really do have to go into it with a fighting attitude if you truly want to dethrone the habits that are oppressing your dreams and goals. The human brain is a fascinating tool! Randy, love the comment and love your website! The human brain is incredible, and knowing how it works is so powerful for personal and professional development. Good luck winning the battle! Oh what a tangled web we weave with those pathways. I’m very excited about the progress science has made in neurology. It helps to understand why some habits (pathways) are so ingrained and why they are hard to change. Well done, Tom! This is such an interesting new take on an ‘old’ subject. Love all this neuro brain science. Makes a lot of sense that all those old non-serving habits have hogged all the brain territory. And to be proactive about reclaiming some territory for the new habits we have to get assertive – even aggressive. Really interesting stuff her Tom! I have only just come across your site and am already get caught up in it ! great article, the brain and how it is wired is so fascinating. I have moved home at the age of 40 to change things in my life and can see how i formed some of my bad habits – working on them!….. This is an amazing article. Want to say though, the habit of capitolizing your “i’s make the word look like it actually contains an L – like I had to read, habit of “startlng ground out of us.” I was thinking what is the habit of “startling” what is he saying here lol. Or ” the habit of hidling”….or “you won’t be successful perlod”…after a few seconds my brain caught on to the pattern. lol Funny, when I copy and paste it here it shows correctly…must be the program you are using to type it initially. Not trying to to take away from the well thought out and researched as well as well written content which really makes people think and thereby forge new pathways in the brain. My brain just is geared to notice these things…Maybe because I am half in love with words. In fact I am being overly critical of my own post above I am obsessing over my mistakes. I have to remind myself always that its what people have to say, not how they say it or whether it is said perfectly! Amy, thanks so much for the kid words. Really glad you enjoyed the post! Let me know – it might be something I have to optimize for certain browsers. Thanks again for the comment Amy!